Monster Catcher Skill Test Video Redemption Game machine is a great fun and exciting video ticket redemption machine, features with eye-catching upright cabinet, with LED lighting around two special cute and side control buttons, comes with a vertical 55 inch LCD screen to display mini game to catch the monsters, includes 7 different ball type monsters as a different ticket value, press the button to catch the falling monsters, and two virtual punch to extruding monster to win related tickets. 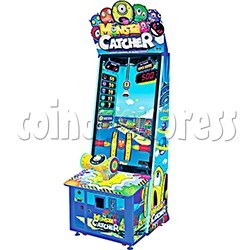 Monster Catcher game play is simple and challenged eyes and hands fast in limit time, it is an chance for player to pass level to win super BONUS, to squeezes the falling ball type monster, passes next level to win super prize, exciting game fun, is suitable for players of all ages. There are 7 levels, each monster is one level, each level passed, the monster's drop speed will be quicker than previous level. - the middle position starts counting down, and a ball monster will fall after the countdown ends. - when the player sees the timing and presses the button, the ball will be squeezed to get the corresponding lottery number. - all the balls of all colors will be squeezed to win the super prize.